The city of Hannover hosted the World Expo 2000. 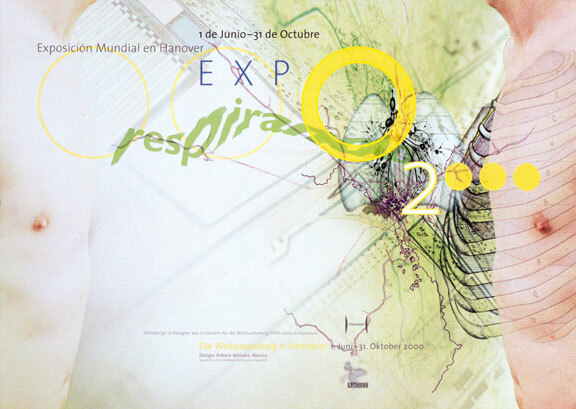 In the spirit of the international tradition of the event XPOster invited twelve designers from twelve countries to fly first class to Hannover and each design a poster during their visit that would represent the city and Expo 2000. The concern to overcome was the scepsis of the locals against the event, and on a larger scale the anxiety people had towards the milestone of the year 2000. The American continent was represented by women— Cathy McCoy (USA), Verónica Majluf (Peru), and myself for México. We were given one day and night to explore the city, and two days to design and produce the poster. Jetlagged and sleepless at 5 AM on the second day, I awoke to go for a walk through the town. In the middle of Hannover I found an ancient forest, literally forming the lungs of the city. I had my design solution. I asked Adam, my boyfriend (now husband) to bare his chest in the freezing cold and took a picture. My concept of future of the pending year 2000 was respirando, to keep on breathing—to let go of the futile belief that one can fully control the future. Breathing is one of many involuntary functions that keep many species alive, and involves continuous exchange. My advice for the year 2000 was to remain open to change, the tenet the World Expo has represented on a global scale for more than a century now. _Respirando,_1999. Poster for the collection: XPoster, Hannover 2000.